This is a decision we are all faced with and it's rarely an easy one. Not only that, but our decision might change over the course of our illness. 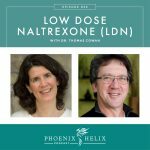 This podcast was inspired by my recent decision to start medication after 4 years on the paleo autoimmune protocol. 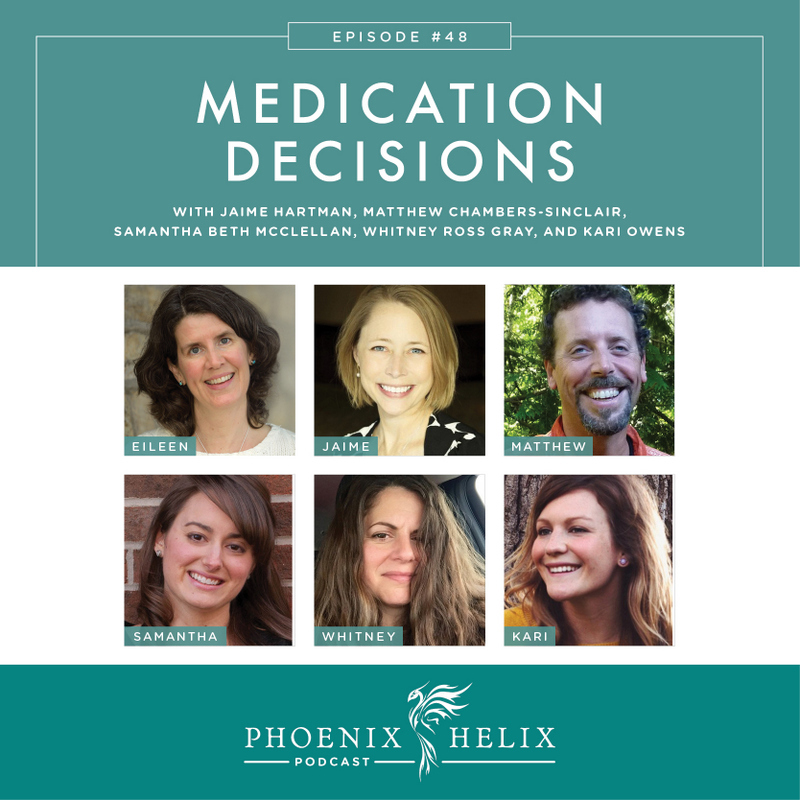 Today, I share the reasons behind my decision and also interview 5 other people about their medication choices. My guests have a wide range of diagnoses and experiences. Some have always taken medication, some have never taken medication, and some have gone on or off medication, based on changes in how they feel. The important thing to know is that there is no one right choice for everyone. My goal with this podcast episode isn’t to provide answers, but just to highlight the complexity of this decision, and let us all know that we’re not alone. To be clear – this show isn’t designed to be medical advice. Definitely work with your doctors when deciding what choice is best for you. I am your podcast host and the blogger behind Phoenix Helix. I have rheumatoid arthritis, which hit my life like a wrecking ball in 2012. 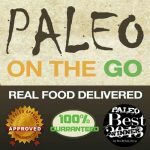 Through the paleo autoimmune protocol, I was able to reduce my symptoms by 95% without immunosuppressant or steroid medication. In 2016, my symptoms increased again, bringing with them rapid joint changes. I made the recent hard decision to go on medication. Jaime Hartman is the blogger behind Gutsy By Nature. She has Crohn's disease and was diagnosed over 20 years ago, at the age of 19. She has been on medication ever since and has experienced both positive and negative reactions. She now tries to avoid prednisone, but finds the combination of the paleo diet and lifestyle in addition to biologic medication, to be the most effective way of managing her illness. She has no intention of going off her medication, feeling that's too big of a risk given the aggressive nature of her disease. She also has no intention of returning to a Standard American Diet, since a nutrient-dense paleo diet seems to make her medication work better. Her philosophy is that the goal should be to live the most vital and healthy life possible, and if medication helps, there's no reason to avoid it. 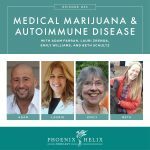 Matthew Chambers-Sinclair has psoriasis and psoriatic arthritis, and you can follow his story through his wife‘s blog: Biohack U. Matthew took medication for over a decade with limited positive results (his condition continued to worsen) and substantial negative results (debilitating nausea from the methotrexate and prednisone psychosis). He decided to stop his medication altogether and try to manage his symptoms through a low-FODMAP paleo autoimmune protocol. This diet has been more effective for him than medication ever was. That said, if his condition worsens again, he would consider all options, including medication. Resources: The Difference Between Folic Acid and Folate (important information for anyone taking supplementation to help with methotrexate side effects.) What is the MTHFR Mutation? Samantha Beth McClellan is the blogger behind AIP Sisterhood. She was diagnosed with ulcerative colitis five years ago and took a variety of medications that helped but didn't stop her flares. It wasn't until she added the paleo autoimmune protocol that her disease became well managed. She was even able to reduce her medication, dropping those medications that gave her negative side effects (Imuran and prednisone). Now, she takes an anti-inflammatory medication called mesalamine, which she tolerates well. She has tried to eliminate the mesalamine, but her symptoms return, so at this point the combination of mesalamine and the AIP is the best choice for her. Samantha has also struggled with a recalcitrant giardia infection that she had to treat with antibiotics. Unfortunately, a side effect of antibiotics for Samantha is an autoimmune flare. Resource: What To Do When You Have to Take Antibiotics? Whitney Ross Gray is the blogger behind Nutrisclerosis. She was diagnosed with multiple sclerosis 9 years ago and has never taken medication. At first her symptoms were mild, and she simply tried to ignore her diagnosis. It wasn't until after she had her second child that her symptoms worsened and she seriously considered taking medication. At this point, she was having difficulty walking. At the same time, she learned of the paleo autoimmune protocol and chose to do that instead. She had such success that she's been in remission for the past 6 years. Whitney said she used to be very judgmental of anyone who took medication, but no longer feels that way. She hopes to never need medication herself, but would consider it if her symptoms dramatically worsened. Article Whitney mentioned: Unicorns and Rainbows – The Myth of the Paleo Panacea. Kari Owens is the blogger behind kariowens.com. She was diagnosed with ankylosing spondylitis 10 years ago at the age of 15. She has had a variety of medication experiences over the years, including a medication-induced remission followed by a relapse where she no longer responded well to medication. At that point, she decided to go off her medications and try the paleo autoimmune protocol instead. Over time, the AIP completely eliminated her pain but didn't stop the disease process on its own. 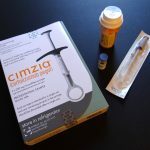 After doing some research, she chose to add the biologic Simponi and achieved remission again. Once achieved, she went off the Simponi and has been in a medication-free remission for the past year.